There are several Civil War items of interest in including a soldier’s monument, cannons, plaque of the Gettysburg Address and a photo of 1923 GAR members. The original marble monument was dedicated in 1875. The marble had deteriorated to the point where it had to be replaced and a beautiful new granite monument, which replicated the original, was re-dedicated before a large crowd and many dignitaries on July 2, 2011. There are inscriptions of fallen soldiers from the county - a number have been added that had been inadvertantly left off the original monument. There are two 5.82 inch 24 pounder flank howitzers, M1844 manufactured at Cyrus Alger & Co. - one in 1849 - the other does not have markings to identify the date. The cannons are pointed South and not by accident according to Muscatine County history. 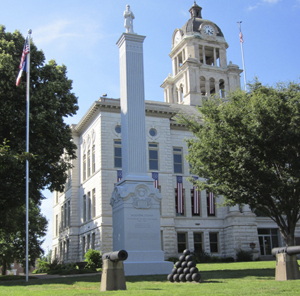 There is a veteran’s monument for all veterans on the east side of the Courthouse lawn. A bronze 6 pounder field gun, M1841 was cast at Cyrus Alger & Co. in 1857 and is located in the center of the lower floor under the Courthouse rotunda. The monument is located on the corner of Walnut and E 3rd Street. This monument is in a nice setting in Oakridge Cemetery. It is granite and about 15 feet high. Dedicated in 1903. Take Calhoun Street south through the business district and past the Fairgrounds. This monument at Oakdale Cemetery includes inscriptions on four sides of soldiers from area including those buried in nearby cemeteries. There is also a group listed as “Buried at the Front.” The monument is granite and is about 16 feet high. It was dedicated in 1898. Oakdale Cemetery is SW of town. Take Liberty Street south which turns into Story Avenue. The monument is on the east side of the cemetery along the road. This is a Civil War memorial dedicated in 1905. The marble shaft is about 10 feet. The cemetery is 1½ miles east of Nichols on the south side of Highway 22. Camp Strong was the mustering point and training grounds for the Iowa 24th, 35th and 37th Infantry Regiments during 1862. The 37th was the famous "Graybeard Regiment" which was composed of men over age 45 and was established for guard or garrison duty. George W. Kincaid of Muscatine County had the original concept for this regiment and later became the colonel and commander. It is said that Confederate prisioners may have been buried here but this is unconfirmed. The exact boundaries of the camp are unknown. The marker is located at the entrance to VanAcker's Mobile Home Park at 2436 Sampson Street. This is in the SW part of town. Take Sampson Steet east (across the railroad tracks) off Grandview Avenue (also Business Highway 61). Highway 6 runs coast-to-coast and is named the Grand Army of the Republic Highway. The state of Iowa has named 11 bridges on the Highway after Iowa Civil War Generals. There are also 29 GAR Highway markers across the state. This bridge is named after William Vandever. He was an Iowa Congressman from Dubuque before the War. He was the Colonel of the 9th Iowa Infantry Regiment and then was promoted to Brigadier General and Brigade Commander. He was at Pea Ridge, Vicksburg and Bentonville. The bridge crosses the Cedar River on Highway 6 just southwest of Moscow. Source: Department of Iowa-Civil War Monuments. This website contains a list of all the Civil War monuments in Iowa.